In Coed Cheer Division lA, Texas Tech leads the division with a Day 1 score of 96.97. The Red Raiders won their first and only national championship title in the division back in 2017 and they are looking to reclaim their crown today with a zero deduction routine in Finals. In dance, TTU is on a mission to defend their titles. The Red Raiders double titled in 2018 taking home gold in both Division lA Pom and Jazz categories. After their Day 1 performances, Tech advanced to Finals in first place in Pom with a score of 95.69. They have a comfortable lead with 1.32 between them and the second place team. Texas Tech is currently ranked second in Jazz trailing behind the Brigham Young University Cougarettes. TTU might be in second but don't count them out just yet. Their theme this season was "Decide To Rise" and that mentality will be in full force today as they take the stage on Day 2. 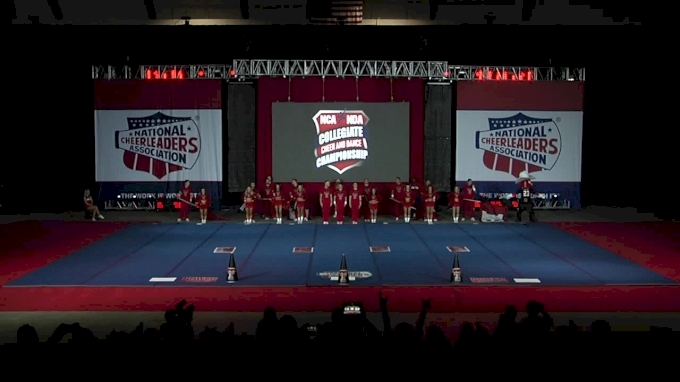 Will the teams from Texas Tech run into the ocean waves today as NCA & NDA National Champions? Tune in to Varsity TV to find out LIVE!